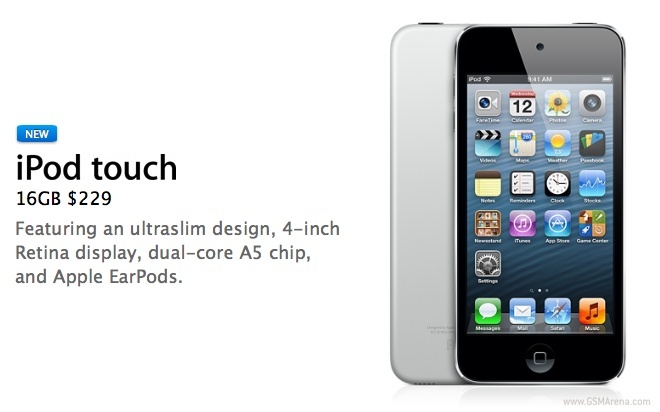 Out of the blue, Apple has launched a new variant of their popular iPod touch. This new model starts at $229 but loses a few features to achieve the price drop. For starters, the iSight camera on the back has been dropped and all you get now is the FaceTime camera on the front. Other omissions include a lack of the mechanical loop on the back for lanyard and no color options other than the default silver. Lastly, the internal capacity is now 16GB. Other than that, the new iPod touch variant is identical to the 32 and 64GB models. It has the same design, the same 4.0-inch Retina display, dual-core A5 processor and comes with a pair of Apple EarPods. While not a bad option for those on a tight budget, it makes more sense to just pay the extra $70 and get the 32GB model with the camera for $299. The 16GB model is now on sale on the Apple online store and will be shipped within 24 hours. Apple retail stores will get it on May 31.